Information Technology has made our modern life more happier and easier.But some time this information technology brings a lots of pain to our normal life.Suppose someone carrying around a tin of mints can hardly be called suspicious but the tin of mints has an ethernet cable sticking out at one end,that should be a bit mourn. Yeah,I am talking about Mini Pwner,the spy computer is invented by Kevin Bong,a Wisconsin-based security research and penetration tester.Here is the full topic of Mini Pwner is the smallest spy computer can causes of big danger. This smallest computer contains TLink TL-WR703N Router with 4GB Cruzer Fit USB Drive which built with OpenWrt and the MiniPwner configuration,USB wall outlet power adapter and micro usb cable,12 inch ethernet cable,Portable battery pack with multiple USB/cell phone charging adapters,a strip of adhesive-backed velcro to attach the WR703N to the battery pack,Hard side case. This mini pwner runs with OpenWrt Linux and Atheros AR9331 Chipset(integrated wireless) which carries Pen Testing Drop Box,Wireless war-walking,Captive Wifi Portal or Rogue Access Point,Nmap network scanner,kismet Wireless network analysis and many more things can do with it.When plugged into a wall,the Mini/Minty Pwner will run a series of scanning software such as Nmap and dSniff that will help the host map out the target’s network.It will also help create a VPN connection so that the host nearby will be able to hook onto its WiFi and run more sophisticated tools. 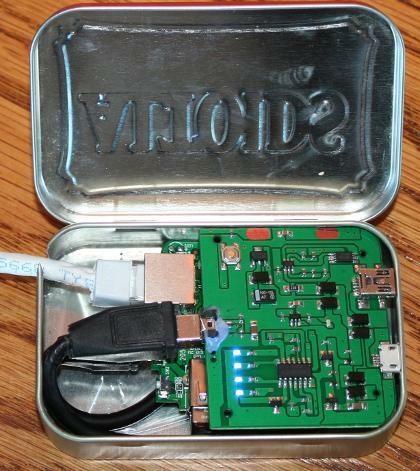 Kevin Bong did mention that while the Altoids’tin box is even smaller and less conspicuous,its metal case could interfere with the WiFi signal.He has assured that it will be sold purely for research and security purposes only,Kevin Bong is selling them on his website for $99 each. It is sure that this mini machine can destroy a large system with in a few seconds.However Kevin Bong has assured that it will be sold to security researchers only but here is the question rise that the price is only $99,where is the grantee ?? ?